I began this page several years ago, worked on it here and there over time, and finally finished it recently. That’s the case with many of my art journal pages: I don’t necessarily start and finish them in one setting, but often do them in phases. The background for this page was colourized with acrylic paint applied with a baby wipe. Over that, I applied paint through mesh tape used to cover seams in drywall. (It sticks to the page, I apply paint with a sponge, and then lift off the mesh). I also applied paint through Punchinella — also called “sequin waste”. The title words were torn from a magazine, and the smaller words were stickers. 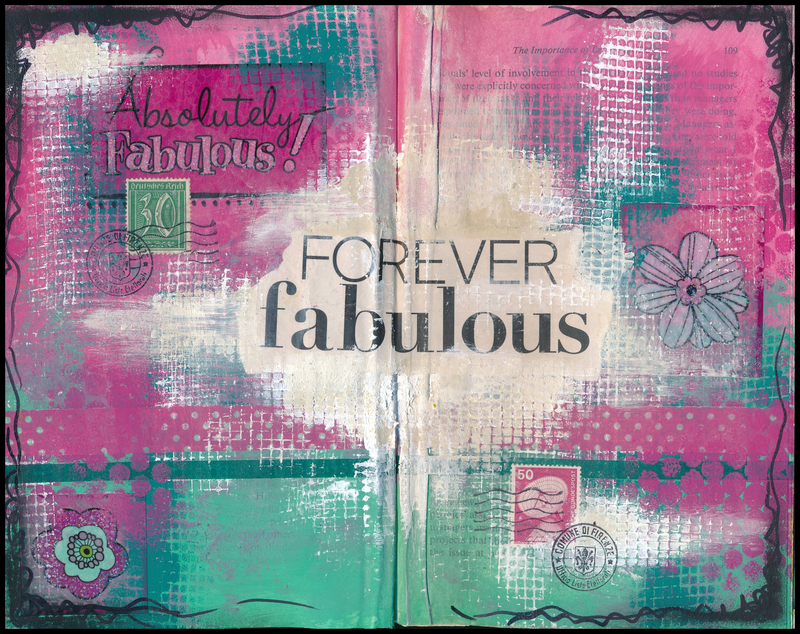 I added postage stamps, rubber stamping (to cancel the postage stamps), washi tape, sharpie marks and pastels blended onto the corners.